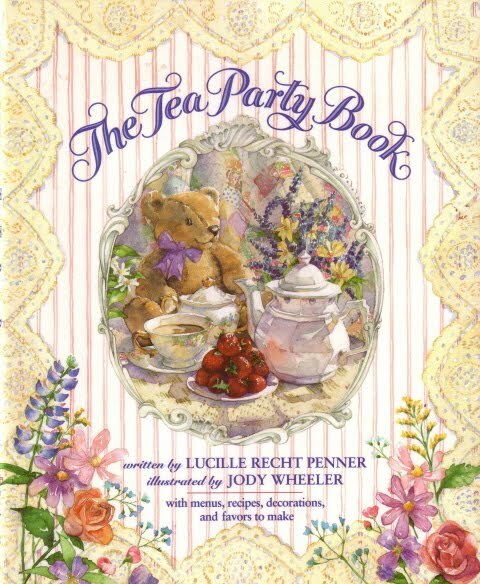 Tea and Books Saturday #31 - "The Tea Party Book"
"The Tea Party Book" by Lucille Recht Penner was actually written for little girls, but my friend Krista gave a copy to this big girl in 1994 and I have treasured it ever since! Aside from the beautiful illustrations (which are by Jody Wheeler), the book also includes recipes, menus and decorating ideas that will benefit tea-loving readers of all ages. The book's themed teas include a Teddy Bear Tea, a Tea by the Sea, and an especially charming Japanese Tea Party young girls would surely enjoy since they are encouraged to dine with their shoes off! I like having children's books in my tea library, and this sentimental favorite is a great reminder that teatime is the perfect way to entertain no matter what age you are. A few weeks ago, Elizabeth in Massachusetts kindly left a comment telling me I might want to check out the new issue of Country Woman magazine, and she was right! 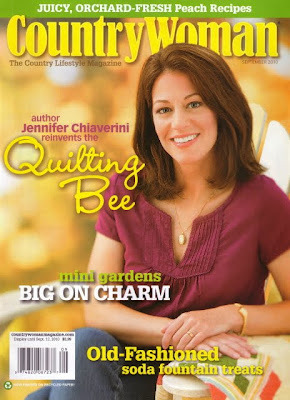 I was doubly delighted to realize Jennifer Chiaverini is featured on the cover of the September issue because I have very much enjoyed her Elm Creek Quilt novels since taking up quilting a few years ago. And here's the back cover of the magazine, which is the reason Elizabeth suggested this issue to me. 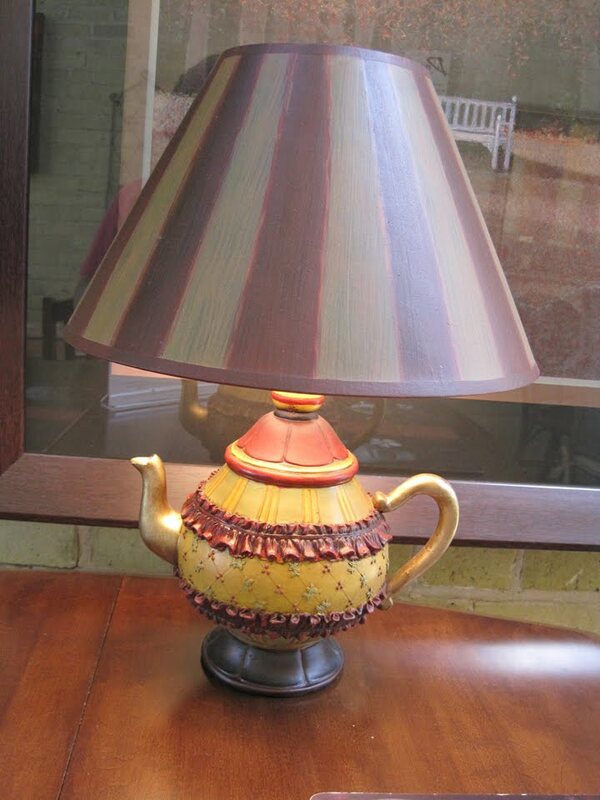 Isn't that a great piece of art for the tea garden? 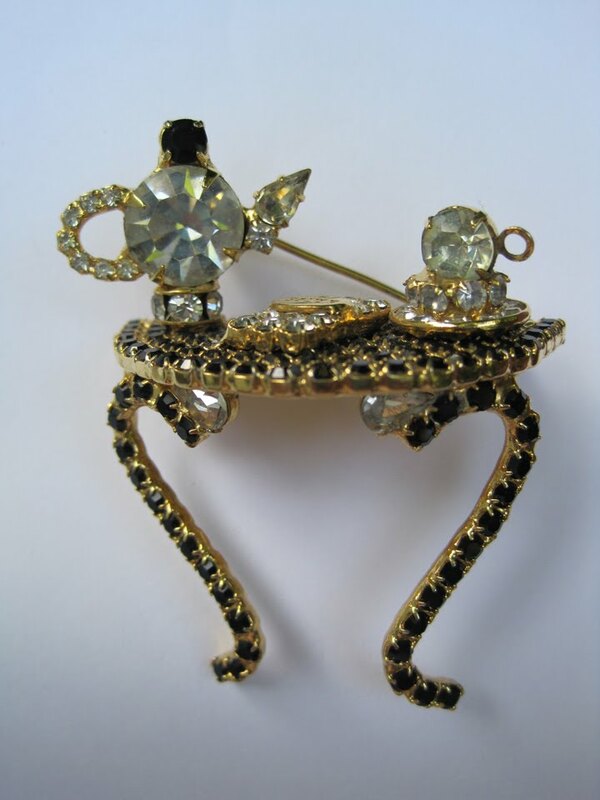 There's a short feature inside on the women who make these clever pieces, and their website is here if you'd care to take a peek. I love that they sell do-it-yourself kits, because as soon as I saw the photo I knew I wanted to make one of these once I find just the right pieces! You just never know where tea is going to turn up. 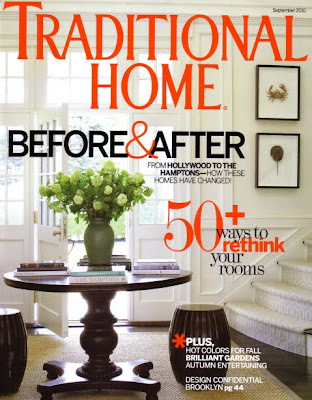 I got the September 2010 issue of Traditional Home the other day, and tea is featured in a five-page spread which I found pretty remarkable in this well-known *decorating* magazine. It shows the Bernardaud china pattern being used at the Palm Court at The Plaza Hotel in New York, several new styles of ceramic tea mugs, a tilt top tea table, tea-dyed fabrics and furniture, a tea shop and more. So whether you prefer the country or the city, there's something tea-related for you to enjoy in the new magazines! 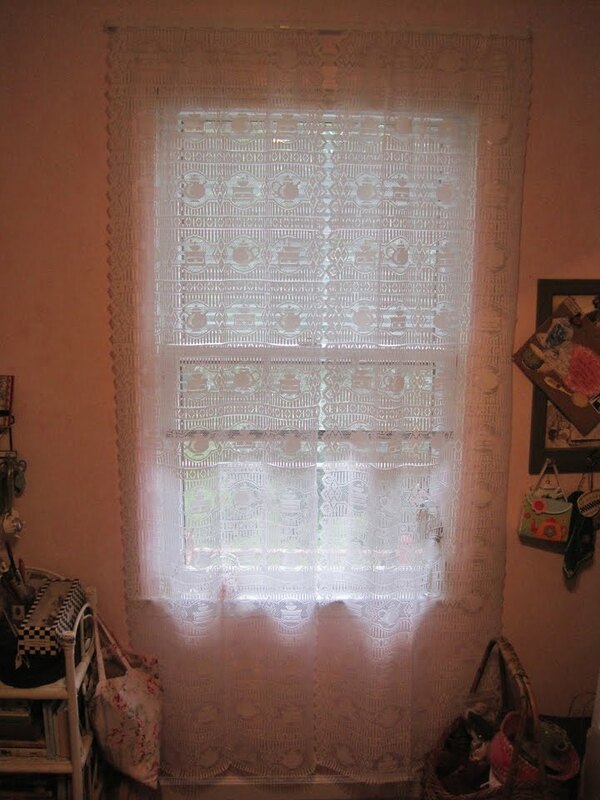 Because my craft room is upstairs and already had blinds when we bought the house, I never really worried about the fact it didn't have curtains. As I've slowly been turning this into a more attractive space, however, I halfway had an eye out for the right pair of curtains suitable for the room's single window. 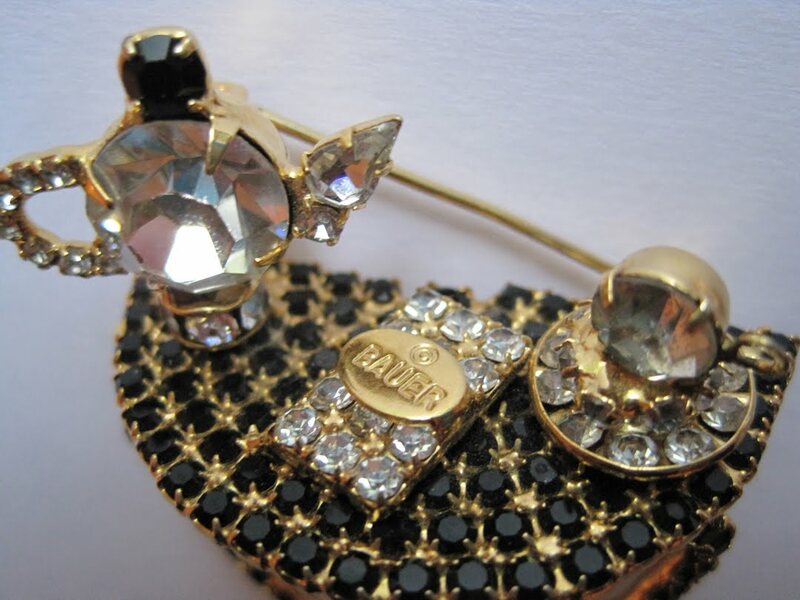 And I found them, on eBay! And here I am bravely showing you a tiny portion of my still-junky craft room. 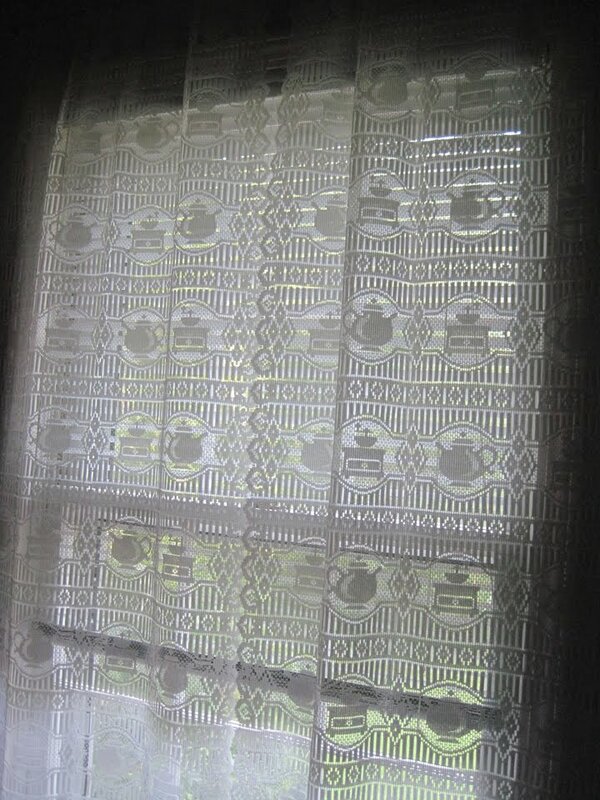 As you can see, the curtains are hanging from an inexpensive metal curtain rod, and I'd love to think of something tea-ish to go up top. I have a pretty chintz topper I could use, but that seems a little fussy with all the lace. Any ideas? At least I'm not in any hurry. It took me four years to find the right curtains. If it takes me four years to find the right topper treatment, I'm OK with that too! Belinda in S.C.! Congratulations! And thanks to *everyone* for entering and for the kind comments. I hope we'll all be visiting for another 1,000 blog posts! Maybe it's not that hot where you live, but here in Georgia it has been H-O-T lately, with temperatures in the high nineties and terrible humidity. It's muggy hot. Thunderstorm-and-crazy-lightning hot. 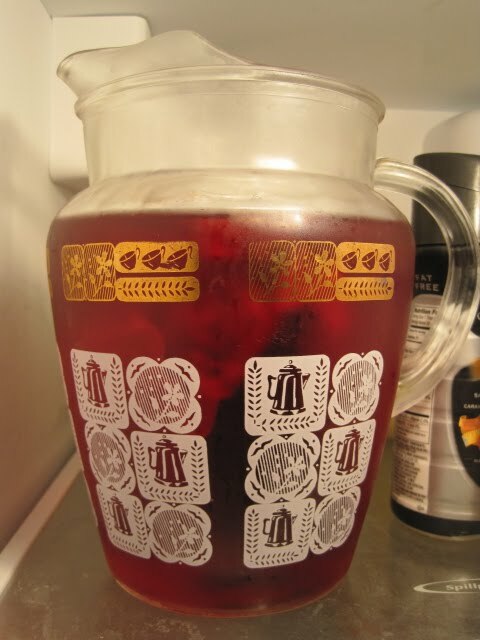 And for that reason, the first thing I do when I come in from work each afternoon is make a nice big glass of iced tea. 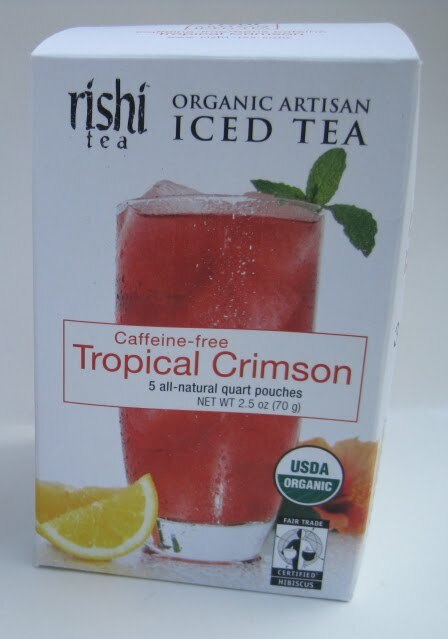 Fortunately I've got some great teas to choose from, and a new one I'm fond of is Rishi's Organic Tropical Crimson Iced Tea. I cold brew it by pouring water over the teabags and letting it steep in the refrigerator for a few hours or overnight, and it is just delicious. 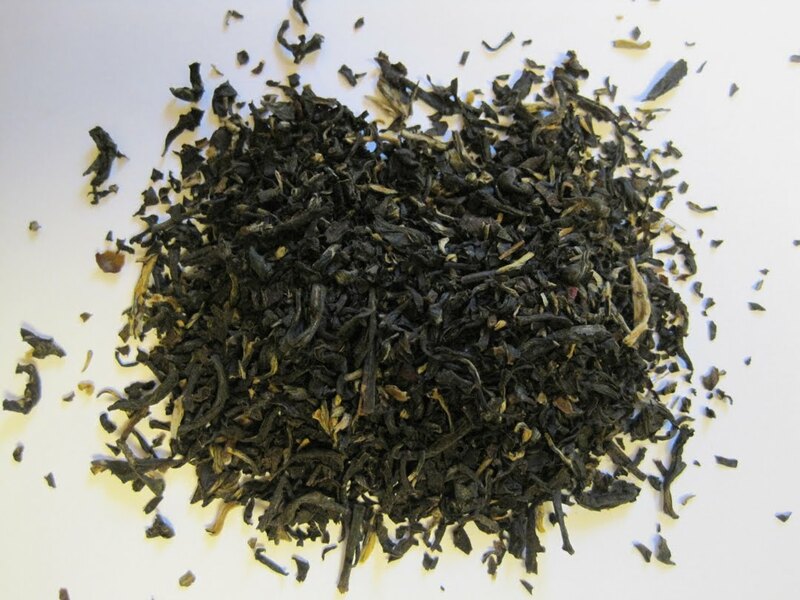 When fully steeped, this tea turns a bright raspberry color, which hints at the tartness of the tea itself. 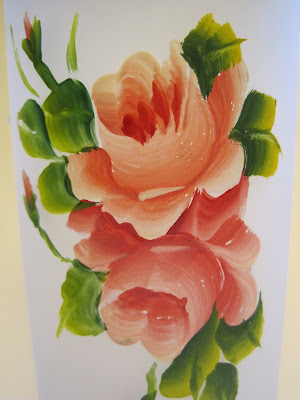 The flavors are sooooo refreshing, and here's how the company describes it: "Tropical Crimson is a refreshing blend of hibiscus, lemongrass and fruity Caribbean flavors that makes an all natural punch with notes of passion fruit, citrus and cooling herbs." (I feel cooler just reading that!) 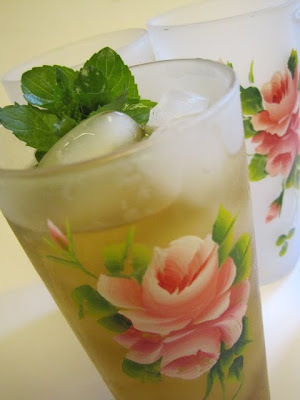 Do you have a favorite iced tea? If so please share, because summer in Georgia lasts a long time! Ginger (who receives the chai tea and the iced tea glass) and Marjo (who receives the chai tea and the logo mug). Congratulations, ladies! If you'll e-mail me your snail mail addresses (my e-mail button is on the right), I'll get your info on its way to Oregon Chai so they can ship your prizes! Today, dear friends, marks my 1,000th blog post! Although the tea and the topics have been great fun to explore, I must say that the *tea friends* I've met along the way have been my biggest blogging blessing. Some of you I've "met" through your own blogs, some I've "met" via e-mail and comments, and there are a few I've even been blessed to meet face to face, including local ladies who I've learned share my passion for tea! 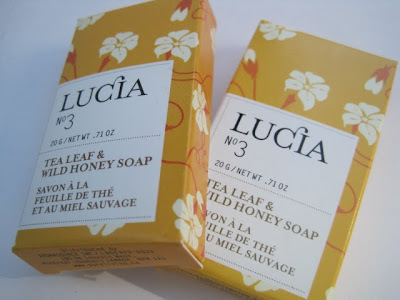 So today, it seemed appropriate to have a fun giveaway just to say "Thank you for reading my blog!" For starters, the winner will receive this oversized teacup and saucer with Judith Glover's charming artwork featuring designs that include teawares. 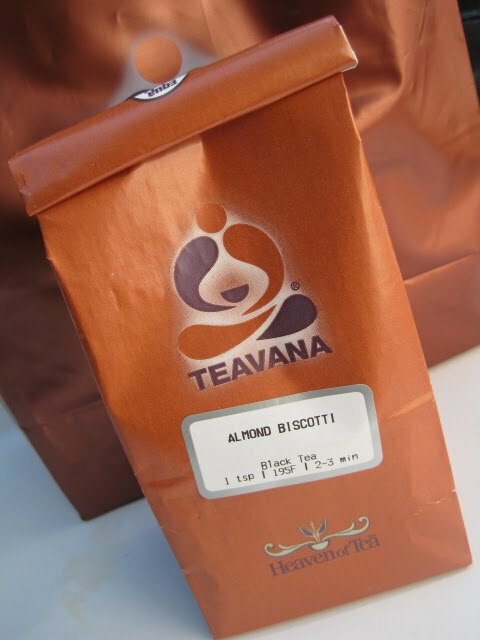 There must be tea, of course, so I stopped by Teavana at Lenox Mall and picked up a package of their Almond Biscotti Tea because it just sounded so yummy! 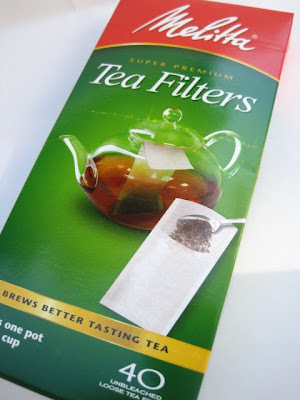 In case you want to make your tea right away and don't have an infuser or strainer handy, you'll get some Melita tea filter bags that will make tea by the cup or by the pot. And if you have any spills whilst making your tea, well then by golly you can clean those hands in style with this White Tea Pomegranate hand soap I found at HomeGoods. But wait -- there's more! A selection of Mary Engelbreit baking products from Michaels! 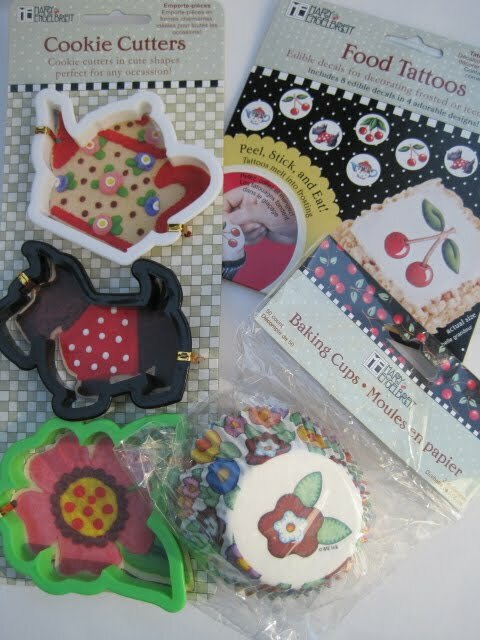 You'll get cookie cutters, including a teapot-shaped one, cute cupcake liners, and a new product to me, Food Tattoos, which transfer the design into the icing on cookies, cupcakes, etc., and a few of them even feature teapots. To enter, all you have to do is tell me the last cup or glass of tea you sipped. (Mine was iced Lemongrass Green Tea.) Just be sure to leave your comment before 7 a.m. EST tomorrow. Good luck, and thank YOU again for making my blogging experience such a happy one! Last week was my busiest work week of the year. 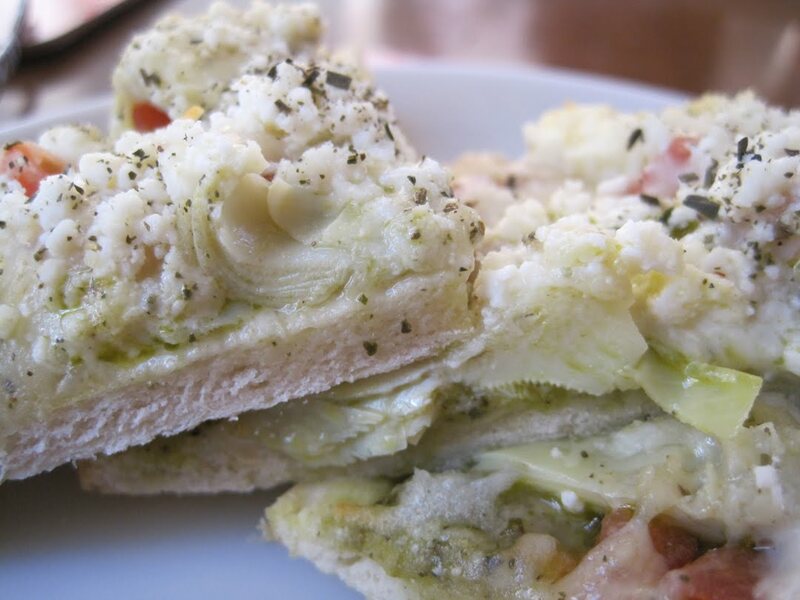 I didn't stop for a lunch hour, and several days I didn't stop for a dinner hour. My colleague and I proofed and printed and finally got through with our magazine's annual newcomers' guide ... and we even finished a bit early so we could both attend family events that were important to us! 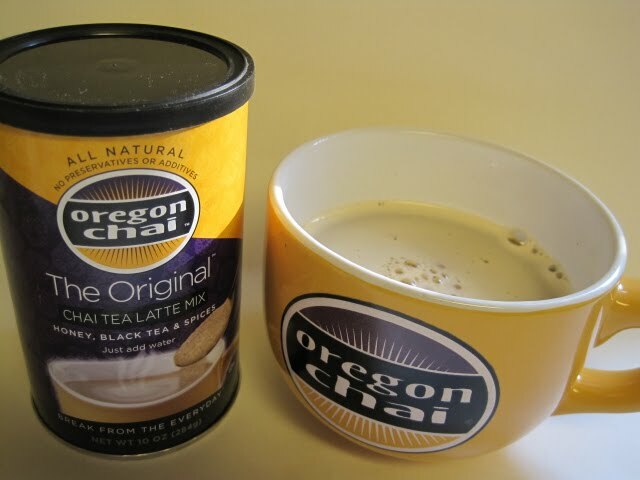 So, can you imagine how delighted I was to return home that last evening after work and find a gift from Oregon Chai, which says it's on a mission to help people find a little "Me Time"? I am all about "me time" right now! I have to confess I had my fingers crossed as I tried this powdered chai tea latte mix, because powdered anything is often a gamble when it comes to taste. 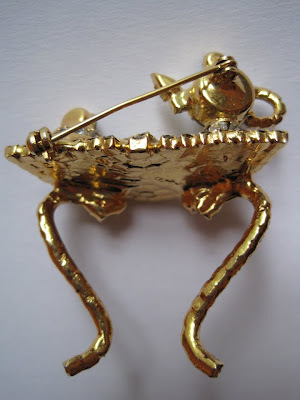 I am delighted to be able to tell you I love it! It had a very rich, thick and creamy taste, and it's every bit as good as any chai I've ordered in a coffee or tea shop. 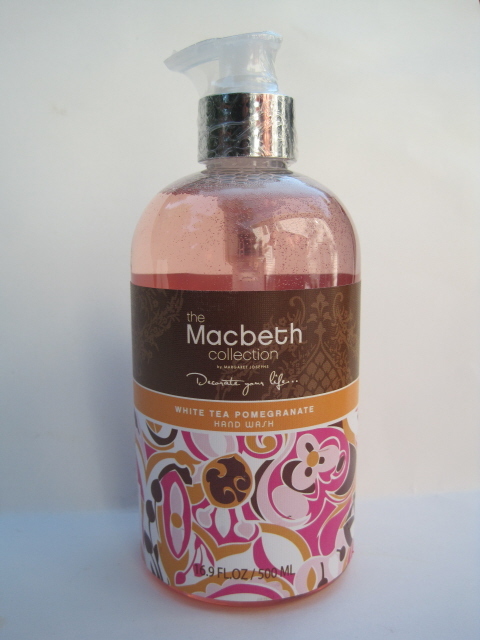 And while I liked it fine right now, I cannot wait to drink this during cooler weather! 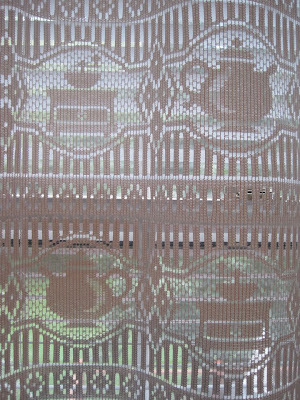 My sample arrived with some great accessories, including the pretty, oversized tea mug shown in the top photo. But there was also a cool double-walled acrylic iced tea glass that I have really enjoyed using over the past few days. (I don't like to drink my chai cold, so I've got iced green tea in my glass.) This looks just like those clear plastic cups you get at Starbucks or other coffee and tea joints, but it's really reusable acrylic. 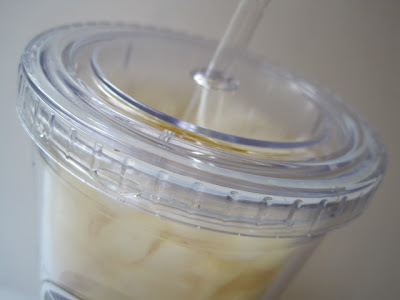 Even the straw is reusable! See? 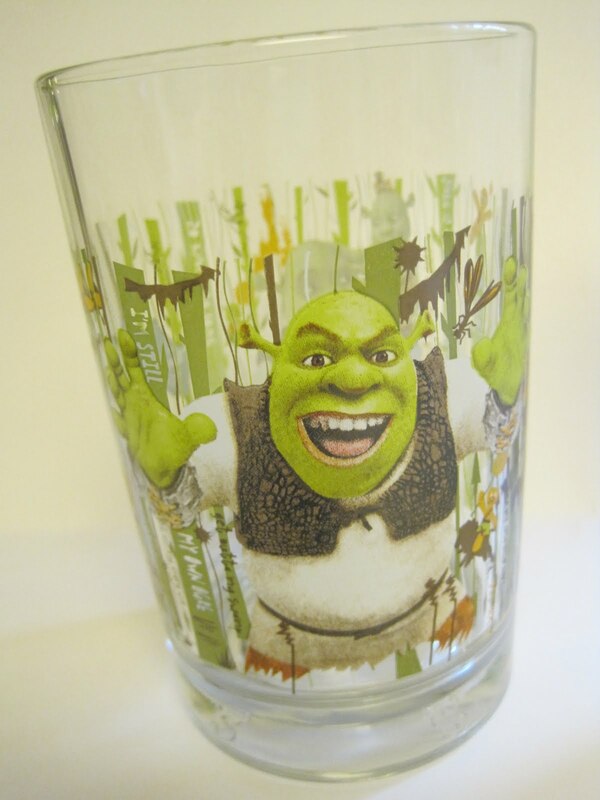 Doesn't this look just like those throwaway cups? And yet it's not. Clever! Now much as I love getting a free sample from a tea company, there's something I love even more: When that tea company offers a giveaway for one of my blog readers! And in this case, there is a giveaway for two lucky winners! You can win one of two gifts: 1) A 10-ounce canister of the powdered chai and the yellow-gold logo mug OR 2) A 10-ounce canister of the powdered chai and the acrylic iced tea cup. 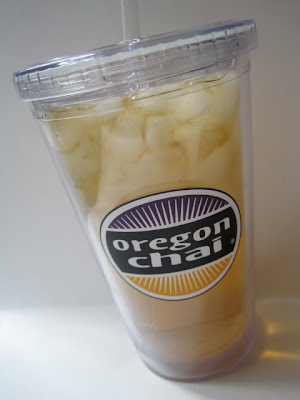 Please let me know if you'd like to enter only the chai-and-mug giveaway, only the chai-and-iced-tea-cup giveaway, or if you're OK with winning either one, and I'll let the random number generator select the winners. Just comment between now and 7 a.m. EST tomorrow. Good luck! Tea and Books Saturday #30 - "Invitation to Tea"
The story begins with the account of Monica's early life in London, where she grew up in a well-run household with a doctor father, an efficient and loving mother, and four brothers who gave her fits. The boys' friend George McCrie was a dear friend of the family, born in India to a tea-planter father and sent back to Europe for his education. George spent his vacations from boarding school with her family, and he was someone Monica had always looked up to. Eventually there came a time when George decided to become a tea planter like his father. Years passed, and then a trip back home resulted in his first encounter with Monica adult-to-adult. Sparks flew. 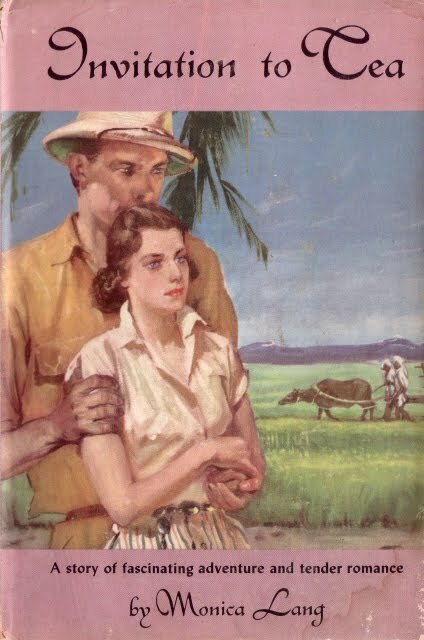 Soon a whirlwind courtship and engagement ensued, and before you can say "teatime" the new Mr. and Mrs. George McCrie were setting up housekeeping in their bungalow in the jungles of India. Frankly, it was difficult to remember this book was not a novel, as it was certainly written in the style of one. Lang did a fine job of balancing the romance with the reality of life on the tea plantation. The romance: She had an adoring husband whose tenderness toward his new wife was touching. Her efforts to set up housekeeping and establish English style gardens were often humorous. The reality: The couple's honeymoon train was knocked off the tracks by some stray elephants, surely a sign of things to come! Monica learned the hard way that mosquito boots had to be worn at all times because of the ever-present threat of malaria. And lions and tigers and bears, oh my, were they ever a part of everyday life on the tea plantation! Naturally, I especially loved the bits where "tea" concerns entered into the story. George's cultural insights about the locals were fascinating, and a living, breathing picture of the tea plantation came into sharp focus. Monica enjoyed learning about the tea production at the factory, and this was one of her earliest impressions: "George was already in the factory, and a lovely, warm, pungent, aromatic smell, which seemed to come from inside the factory itself, pervaded the atmosphere. Small boys were busily carrying baskets of green leaf on their heads into the building and a long line of pluckers stood some distance away beside a little shed where each one was having the contents of his basketful of afternoon plucking carefully weighed. The low hum of machinery in action was audible all around. I had little idea how the fresh green leaf finally appeared as the finished product which reached the grocery store shelves …"
Life on the tea plantation was often lonely, and the few friends they were able to make and keep were cherished. Monica's insights about men and women definitely rang true for me, although I was amused at how so much of it was so innocent and so (beautifully!) politically incorrect. Still, it's almost hard to believe a woman ever got accustomed to the monsoons, the leeches, the sorrow of having to send young children abroad for school (although I wanted to cry out, "Homeschool, y'all!" at several points in the book!). I hadn't really paid much attention to the timeline of this book until 1939 when the war intervened. There, Invitation to Tea took a turn I did not see coming, and that's all I'll say about that. Except to say this: This is one of the most touching books I've ever read, and I fully believe my fellow tea lovers would adore it. And happily, I found a link to Invitation to Tea so you can actually read it for free! Enjoy! It's been a while since I've come across any type of new tea candy, so I was happy to find this tin of Oralfixation Green Tea Mints. 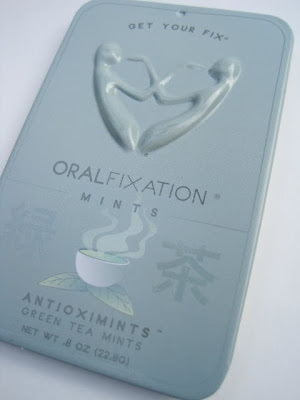 I love the sleek, slim design of the pale green tin, and happily, the mints are delicious! 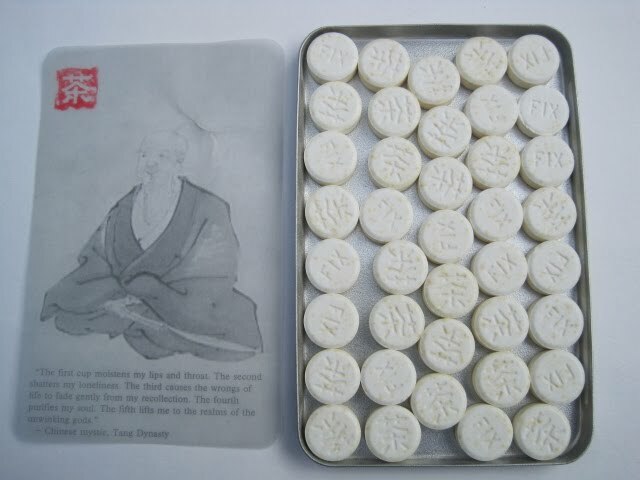 When I opened the tin, there was a surprise inside: this piece of paper bearing an image of a "Chinese mystic" along with a popular tea quote you may have seen before. It says, "The first cup moistens my lips and throat. The second shatters my loneliness," etc. The word "FIX" I understand, but the symbols are a mystery to me. 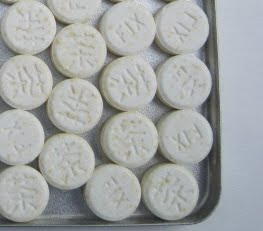 I hope they say something pleasant since I do plan to be eating them all in the days ahead! 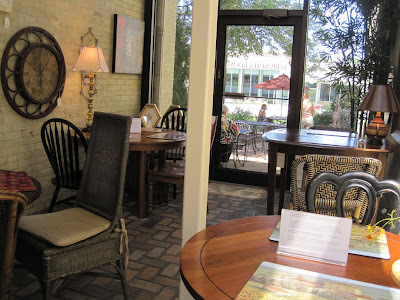 The first time I ever had any Octavia Tea was during my recent trip to Wisconsin, where I discovered it being served at the Atrium Tea Room in Sheboygan Falls. 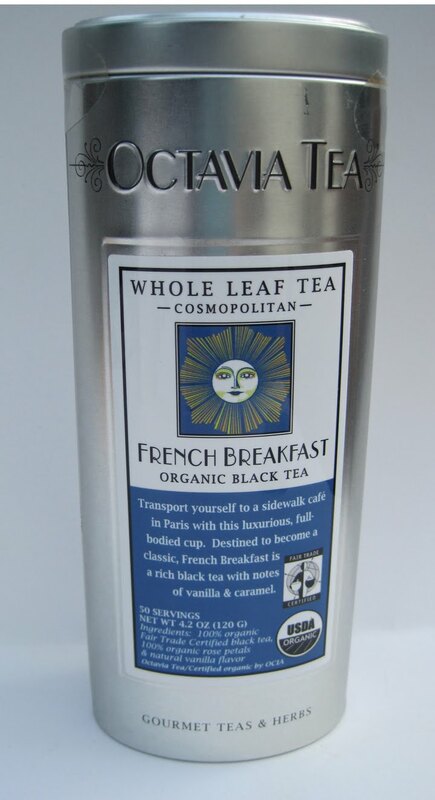 There I enjoyed the Rooibos and Roses tea, but I also purchased a tin of Octavia's French Breakfast Tea to take home with me. This is a black tea described as having notes of caramel and vanilla, and it sounded too tempting to pass up. When I opened the tin, I was pleased to see its design. 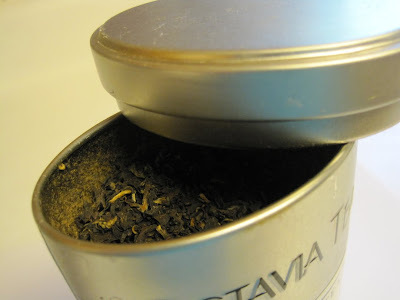 I realize it's always nice when tins have those inner seals to keep tea fresh, but some of them are so hard to open, I always seem to end up slinging loose tea around! 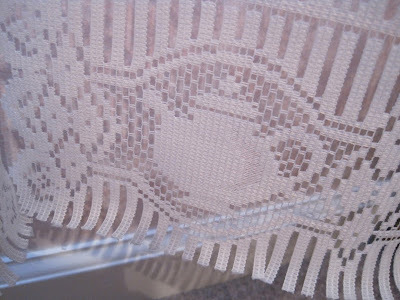 You can see from the design of this one that it is much easier to get into. And the tea? I'm happy to report it was just delicious! The first time I had a cup, I brewed it for a full five minutes and found it too strong for my taste. In fact, I thought I detected the merest hint of Lapsang Souchong, and I was not happy. But I decided to try again, with a little less tea, a little shorter steeping time, and the result was the delicious caramel and vanilla taste advertised. A happy customer here! 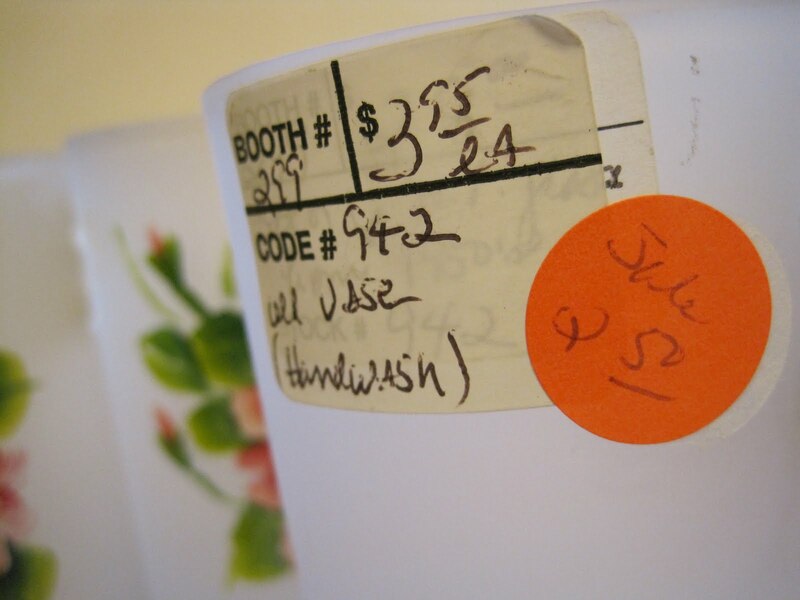 Here's a close-up of the top of the tea table, and you can see where it's cleverly marked by the designer, Dorothy Bauer. The back of the pin shows the incredible work that went into this piece. Her designs can be found at a lot of online sources, but I think I can safely say I have already found my favorite Bauer piece! My current favorite iced tea glass comes from a set of four I got at a local antique mall last year. 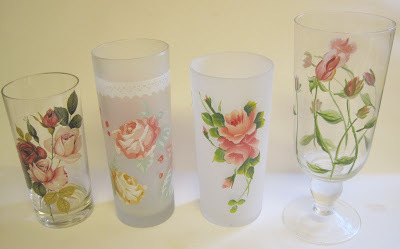 The frosted glasses are decorated with beautiful roses that remind me of old-fashioned handpainted toleware. Bargain hunter that I am, I had actually looked at these glasses for at least two years before purchasing them. I "visited" them several times while they were $3.95 each, but $16 for four glasses just sounded like too much. Then one day, I saw a bright orange sticker and the magic number "$2.50." That's just the price I was waiting for. Sold! 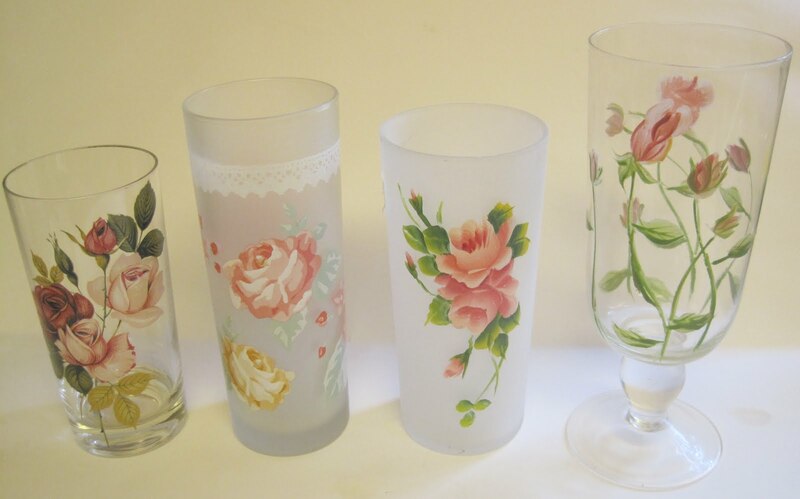 When I pulled these glasses down from among some other glasses the other day, I realized I've had a bit of a rose theme going without even realizing it. At least everything will be good for "mixing and matching" if I ever need to entertain a group where lots of folks want iced tea! 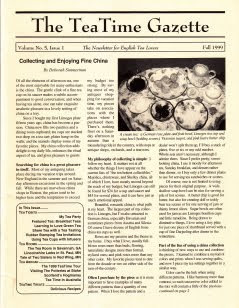 Recently I came across a few sample copies of some old tea newsletters. To be honest, I don't remember how or why I acquired the oldest ones, but they were so fun to revisit I thought they might be worth mentioning here. The oldest one is the Mary Mac's TeaTimes Newsletter from October/November 1994 (Volume 3, Number 5). Apparently each issue featured a themed tea, and this issue's was a "London Hotel Lobby Tea," recipes and photos of which appear inside. Editor Karen Giordano reported on a tea tour to England, which included a sighting of the Queen! 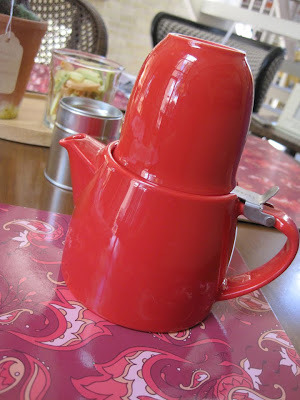 There was also an interesting article about James Sadler and Sons teapots. This 16-page newsletter is printed on white paper with black and white photos inside, and spot color on the front and back. 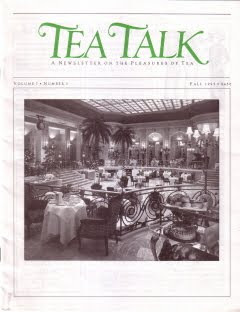 My copy of Tea Talk: A Newsletter on the Pleasures of Tea is the Fall 1995 issue (Volume 7, Number 3). The elegant cover photo was taken in the Palm Court of London's Waldorf Hotel. 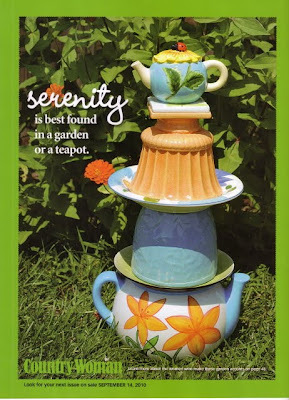 This quarterly newsletter was edited by Diana Rosen, whose name I recognized as an author of several tea books. There were articles on tea-themed postcards, a green tea ceremony, brief reviews of several tea places across the U.S., recipes and several other fun features. An article on teapots mentioned that the author, Tina Carter, had formerly edited and published a newsletter called "Hot Tea" just for teapot collectors! This 24-page newsletter was printed on white paper with black and white photos throughout, and spot color on the front and back. 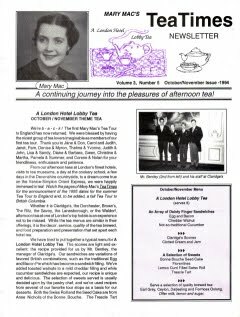 My issue of The TeaTime Gazette: The Newsletter for English Tea Lovers was the Fall 1999 issue (Volume 5, Issue 1), and the editor was Linda Ashley Leamer. 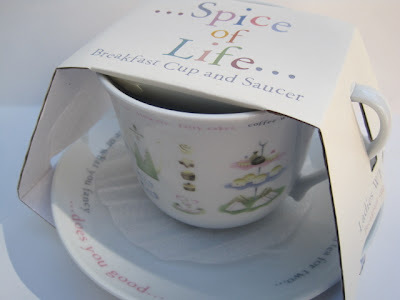 There are articles on breakfast teas, green tea, rubber stamping tea invitations, a visit to the potteries at Stoke-on-Trent, several tearoom reviews, recipes, a review of teacup infusers and more. This newsletter also had lots of personal photos included, which I'll bet readers loved! This 24-page newsletter was printed on peach colored paper, but I also have another issue, from Winter 2003, which was on ivory paper, so I wonder if they tried to use a different color each time. 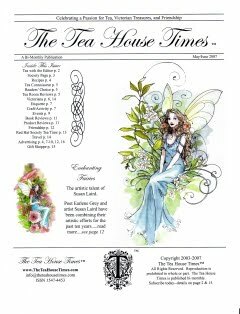 Although I can't find that any of those newsletters is still being published today, another newsletter, The Tea House Times, is still going strong! This is their May/June 2007 issue, which includes a reader essay, book reviews, a few recipes, an events listing and more. This 16-page newsletter is printed on glossy paper and has color illustrations and photographs throughout. I got this sample issue at the World Tea Expo several years ago, and I like their idea of offering the newsletter to tearoom and B&B owners at a discount so they can provide it for their customers. Do any of you subscribe to a tea newsletter, one I've mentioned here or perhaps one I've not yet heard of? Tea and Books Saturday #29 - "Having Tea"
Having Tea is a book that fits a lot of categories: lifestyle book, tea cookbook, history book ... it's one of those tea books that truly has something for everyone. The photography (by Keith Scott Morton) is so lovely and elegant, I enjoy opening this book at any time and for any reason. 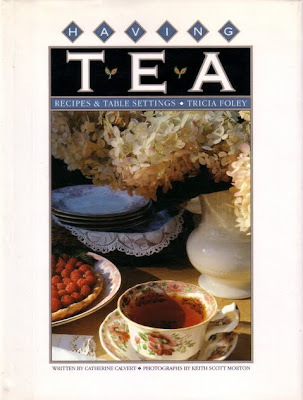 Tricia Foley, who is credited with the recipes and table settings, and Catherine Calvert, who wrote the text, were longtime contributors to Victoria magazine back when Nancy Lindemeyer was editor, and this book, it so happens, came out the same year as Victoria. It opens with one of those black and white photos of women in Victorian era dresses pouring tea for themselves out on some grand white-columned porch, and it's really a fitting image which sets the tone for this book. In her introduction titled "The Pleasures of Tea," Calvert notes that "the real wealth of the tea table lies in its ability to enrich the everyday, gild the moment with importance, and celebrate the loosening of the day's demands." That's exactly how I feel about my teatime, although I could never have said it so gracefully! The book offers inspiration and recipes for a variety of teatimes, including a Dessert Party Tea, Fall Tea in the Country, Brunch in the City and a Proper Children's Tea. Looking at the menu for the Christmas Eve Tea, I was reminded once more that every time I look at this book I've been meaning to try that chapter's Cream Roses, which are tarts filled with cream piped into the shape of huge pink roses. It is one of the prettiest teatime treats I have ever seen, and I really *must* try these! As always, I learned several interesting bits of tea trivia while reading this book. In a section on the history of English tearooms, Calvert tells of an 18th century woman named Maria Tweck who "opened an unlicensed tea shop -- women were forbidden tea licenses -- and refused to shut it, though fined time and again." Now don't you just love that? I'm a great believer in that old saying about how well-behaved women rarely make history. 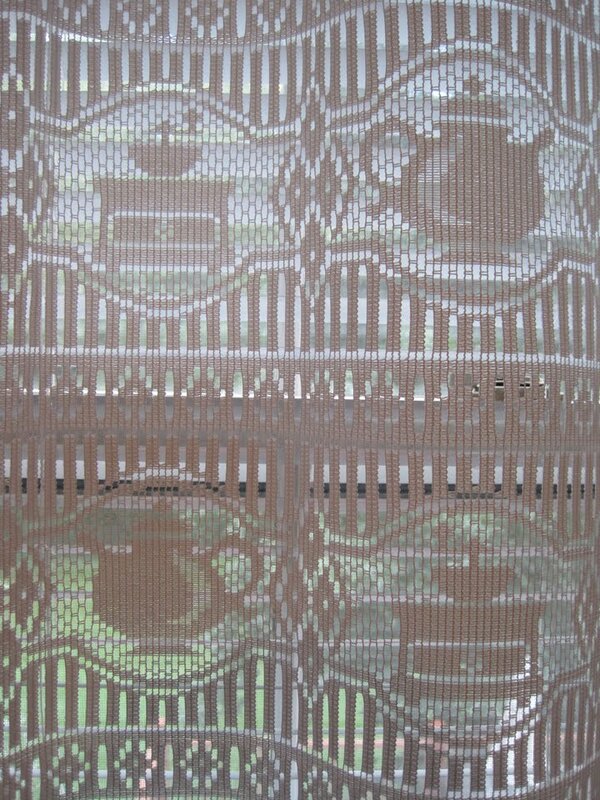 If I had a tea shop, I think instead of the usual "Anna, Duchess of Bedford Tea" I'd offer a "Maria Tweck Tea." The book also has suggestions for what to have on hand in one's tea larder, and there are some quick and easy ideas for teatime treat fillings, breads and spreads. This is quite a useful book, but the eye candy within is probably what I like the most! 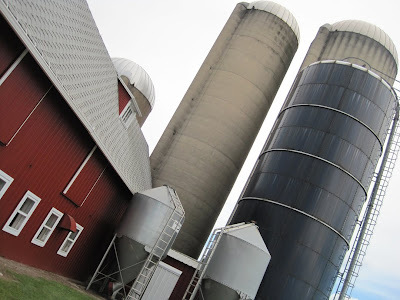 Since I've already milked this trip to Wisconsin for so many blog posts this week, I thought perhaps I could be forgiven for concluding with one non-tea-related post about my tour of a small, family-run dairy farm near Green Bay. (Besides, lots of us add milk to our tea, so it could be argued that this is semi-related to tea!) I felt very blessed we got a personal tour thanks to friends of friends. That's my husband Alex at right talking to the owner of the farm about his dairy operation. It was a pretty warm day by Wisconsin standards, so I was surprised when we got in the barn to find that the cows were actually enjoying cooler temperatures than we were! I didn't ask what sort of cooling system is in place, but it's nice to know the cows are treated well. 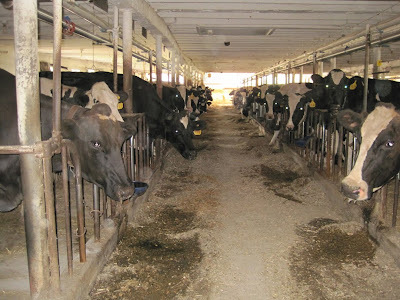 (My husband learned that when the cows go back out into the pastures after the evening milking, there is actually sand spread out to help give them a cooler place to sleep, which I found interesting since I've never given much thought to cow comfort.) Also, although I'd made a point to wear shoes that could be washed off, I was very surprised at how clean this barn was! There is a system in place that helps automatically clear out the, um, "debris" left by the cows, so that helps a lot. The calf at left had just been born overnight! Wisconsin certainly has more silos than I've ever seen before, and it boggles my mind to imagine how much corn is contained in the silos. 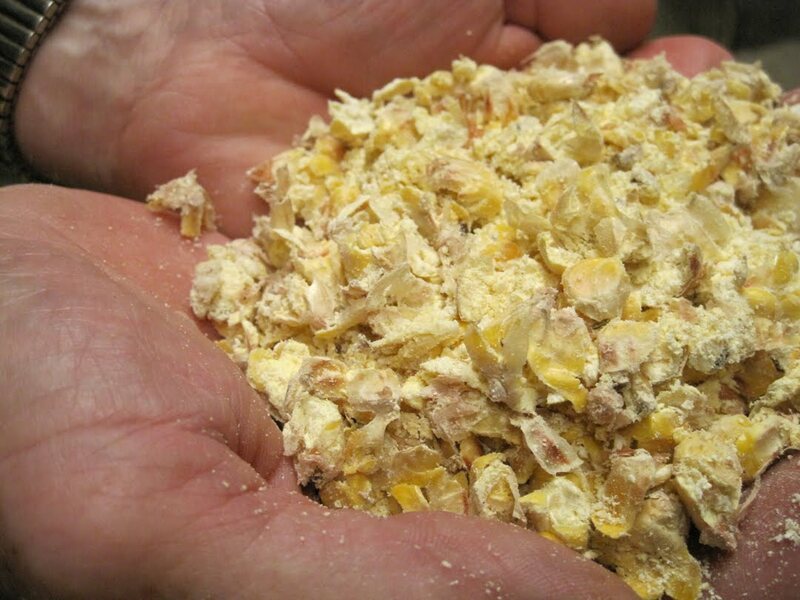 Here is some corn after it's been processed a bit. 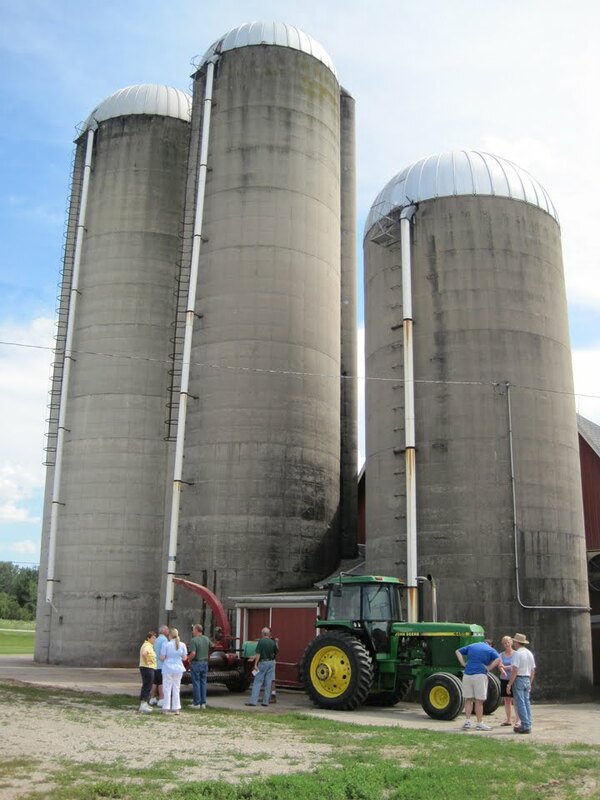 And here is my little group of family and friends in front of the silos. Now while this is a small operation, I was most struck by how labor-intensive the work is. The family milks the cows at the same time early morning and early evening, seven days a week, rain or shine or snow or what have you. 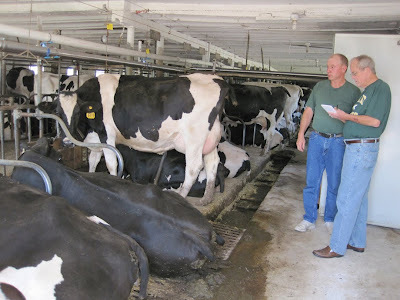 They get to take a half-day off every once in a while thanks to friends who offer to come in and milk the cows for them. This family farm has been in operation for three generations so far, and it was wonderful to see and hear of their obvious love for what they do. 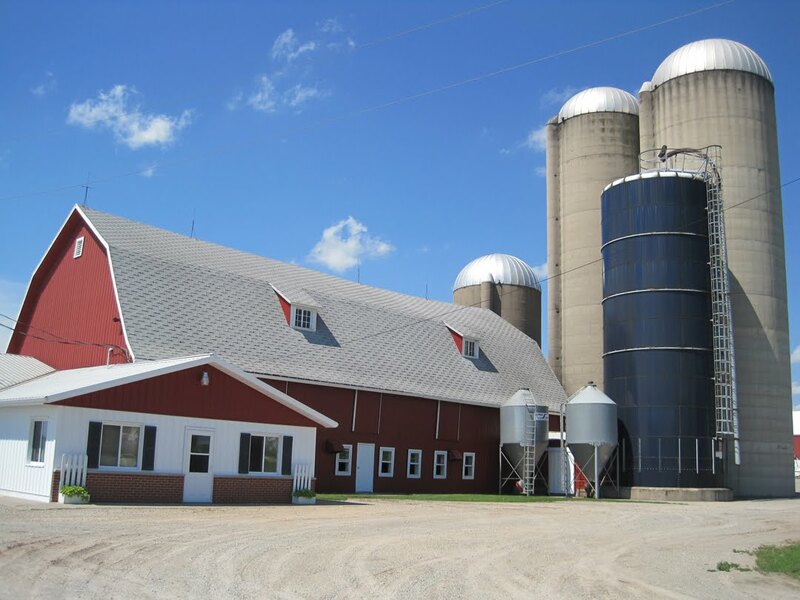 I think I was most struck by what a commitment it is to have a dairy farm. And as someone who loves her milk and cheese, I'm quite grateful! 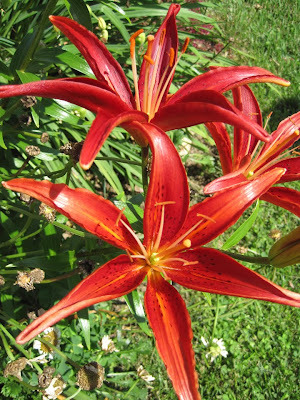 Naturally, I had to snap a few flower photos, too. 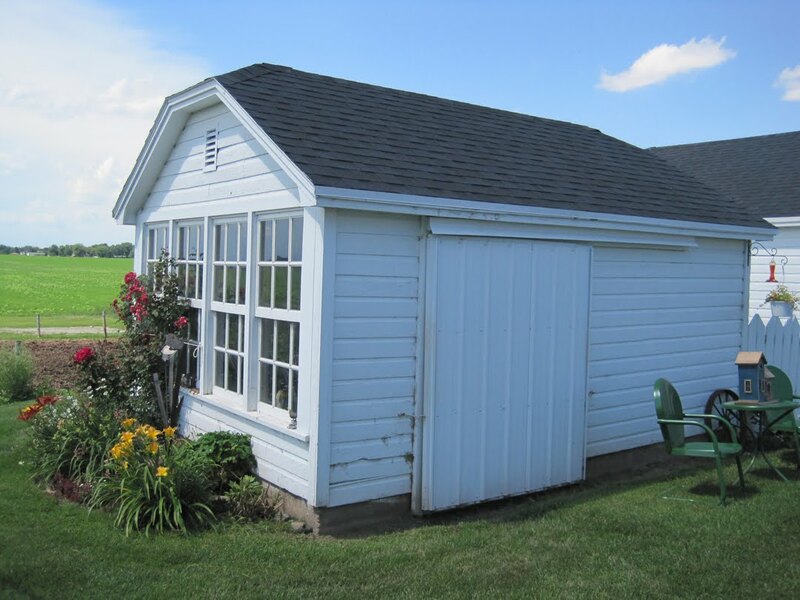 I thought this storage shed was simply charming! 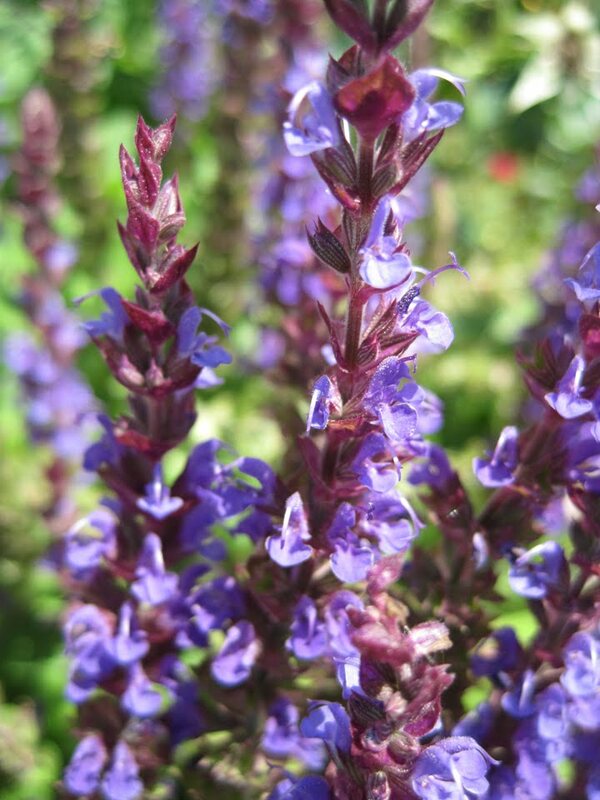 The lady of the farm tells me this purple flower is some sort of perennial but she doesn't know what it is. Any ideas? I think they blend well with the classic red of this wonderful Wisconsin barn. 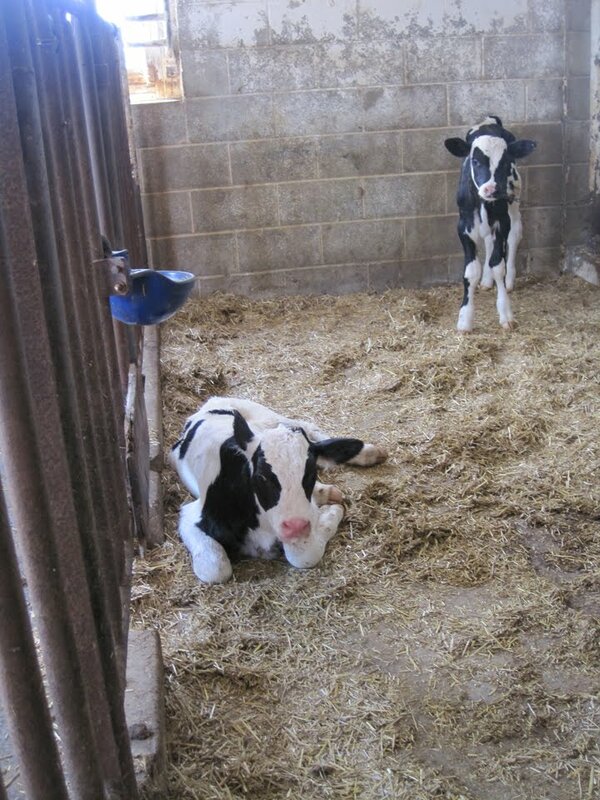 And that wraps up my visit to dairy country, so thanks for coming along this week! 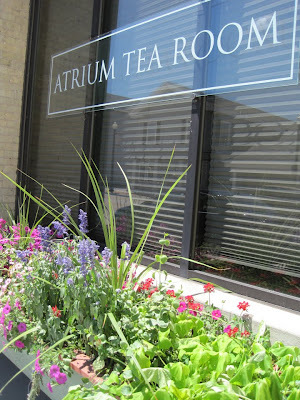 Atrium Tea Room, Sheboygan Falls, Wisc. 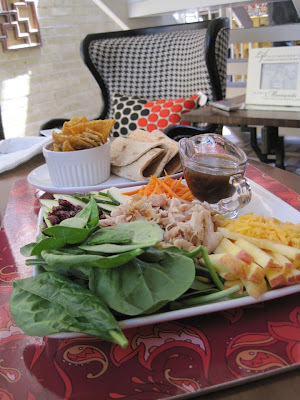 After our visit to Kohler, Wisc., Alex and I stopped by the Atrium Tea Room in nearby Sheboygan Falls for lunch. I liked the fact that banners including the words "Tea Room" could be seen as you approached! It's called the "Atrium" Tea Room because it really is in the atrium of Richardson Furniture Emporium, a great furniture and gift store. A pleasant woman who seemed knowledgeable about the teas quickly took our drink orders. Alex got a Diet Coke while I ordered a pot of Rooibos and Roses tea from Octavia Tea, a new brand for me. It was delicious! 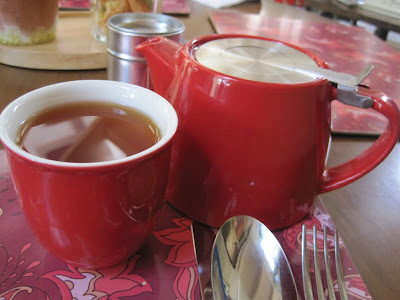 With the rooibos and herbal teas, you could get a second infusion of your tea at no charge -- and I did. 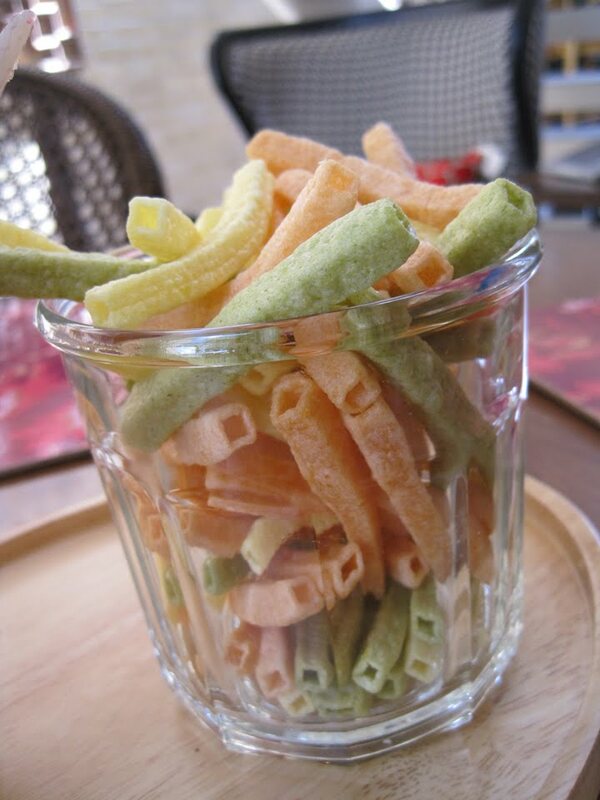 These "vegetable chips" seemed to be going to all the tables, and I thought they tasted like healthier versions of Funyuns -- airy and crispy. 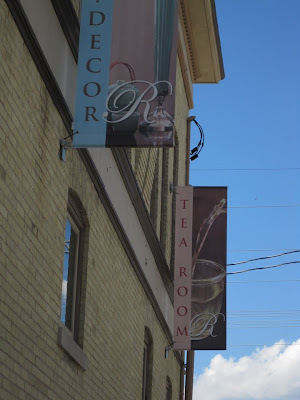 I didn't realize that full afternoon tea with scones, finger sandwiches and sweets is indeed available at the tea room with 24 hours notice, so I missed that option but will look forward to trying it there on a future trip. Alex got the Chicken Flatbread Plate, which he very much enjoyed. 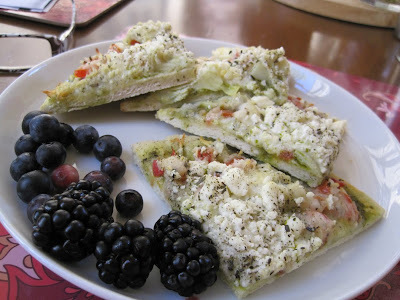 And as soon as I saw the menu listing for the Crispy Tea-Pesto Flatbread, "Prepared by Chef," I knew that's what I would be ordering! Here's the menu description: "A delightful mix of green tea based pesto, feta and mozzarella cheeses, artichokes and tomatoes on flatbread sprinkled with our China Lung Ching green tea, then baked to perfection; served with fruit ... 15 minutes to bake ... well worth the wait!" And it WAS! It's rather a smart idea to have a tea room in a furniture store, since the attractive (and comfortable) chair I sat in could have gone home with me if I'd so desired. 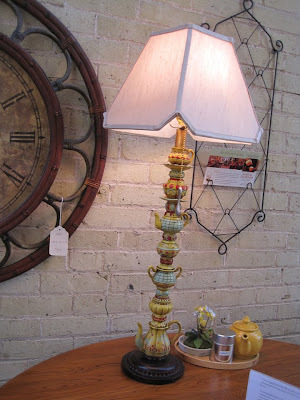 I loved their teapot lamps, too. I had a great time at this lovely tea room and gift shop, and on my next trip to Wisconsin I'll know to make plans for full afternoon tea! The Kohler Design Center in Kohler, Wisc. 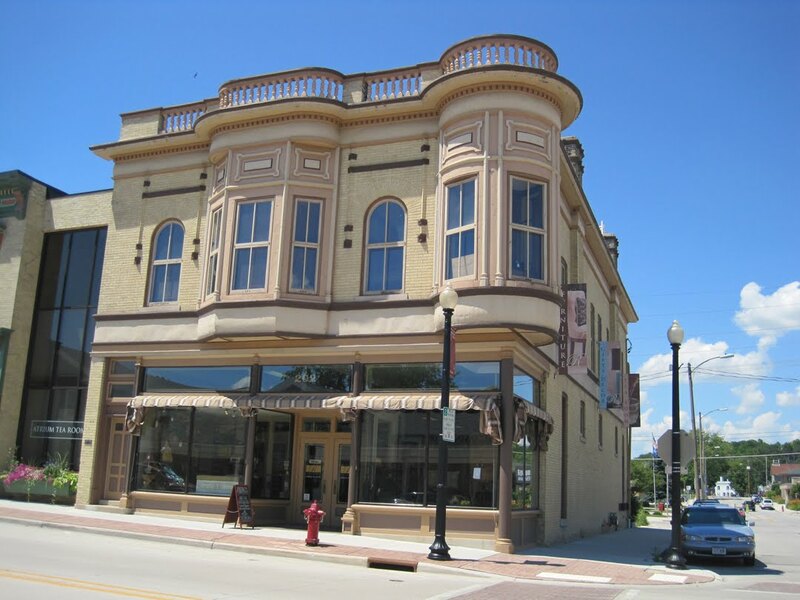 Visiting Plymouth and Sheboygan Falls, Wisc.